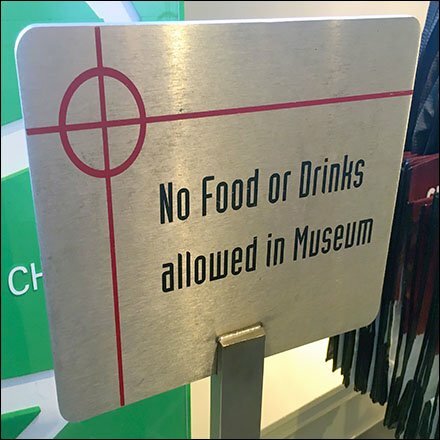 Since this No Food Or Drinks Warning signage was posted in Washington’s Spy Museum, you pretty well should assume that you are under surveillance. After all, it is a Spy Museum. Worth noting is that regulatory signage matched navigation and other signs for on-site branding. If you did not pick up on it, the branding element is the cross hairs, as if from a telescopic rifle sight. This No Food Or Drinks Warning see at the International Spy Museum and Store, Washington DC.